Second Lieutenant James Herbert Grahame (Royal Air Force) when bombing Herseaux aerodrome, obtains two direct hits on a hangar, completely demolishing it. Four members of 29 Royal Air Force engage a large number of enemy scouts shooting down five, Lieutenant Henry Coyle Rath accounting for two of the victories. For this action he will be awarded the Distinguished Flying Cross, though he will be killed in a flying accident less than two weeks after this action. Major General Louis James Lipsett CMG General Officer Commanding 4th Division is killed in action at age 44. He becomes the last British General to be killed in the Great War when he is mortally wounded in the front of his own line, while engaged in a reconnaissance. At the Canal de la Sensée near Aubencheul-au-Bac, Nord, France, Corporal James McPhie VC (Royal Engineers) is with a party of sappers maintaining a cork float bridge, which when our infantry starts to cross it just before dawn begins to break away and sink. Corporal McPhie jumps into the water and tries to hold the cork and timbers together but this proves impossible so he swims back and collects the materials for repair. Although it is daylight and the bridge is under close fire he then leads the way to the bridge, axe in hand. He is severely wounded and dies almost at once. For his actions he will be awarded a posthumous Victoria Cross. Lieutenant Colonel Claude Swanwick Worthington DSO (Manchester Regiment commanding 5th Dorsetshire Regiment) is killed at age 41. Captain John Edmund Greene DFC (Royal Air Force) a 15-victory ace killed at age 24. He is Canada’s first ace and was shot down 10 days before being fatally shot down today. Captain Humphrey French Flowers (Royal Air Force) is shot down and killed over Ledeghem at age 22. He is the son of the Reverend John French Flowers Vicar of Gt Carlton and his brother was killed last April. Captain Edward Aubrey Persse (Royal Field Artillery) is killed in action at age 37. His younger brother has been killed in June of this year. Captain Sacheverel Darwin Wilmot (Royal Garrison Artillery) dies of influenza in Karachi Military Hospital at age 33. He is the son of the Reverend Darwin Wilmot. Captain Denman Lambert Henry Baynes MC (Royal Garrison Artillery) is killed at Ypres at age 32. He is the son of Admiral Henry Compton Baynes. Captain William Sandilands Brown (North Staffordshire Regiment) is killed at age 26. He is the son of the Very Reverend Dr Brown. Lieutenant John Bateson (Royal Field Artillery) MC is killed at age 20. He is considered a naturalist of exceptional promise. He is the elder brother of the anthropologist, social scientist and linguist Gregory Bateson. Lieutenant Claude Melnot Wilson DFC (Royal Air Force) is killed at age 20. He is an 8-victory ace. Lieutenant Arthur Noel Buchanan (Royal Air Force) dies of pneumonia while on leave at home at age 33. He is the son of the Honorable ‘Sir’ John and Lady Buchanan and had served in Mesopotamia from 1914 to 1915, where he was a prisoner of war. Second Lieutenant Robert Aubrey Hastings Lloyd (Royal Air Force) received four days earlier at age 18. His brother was killed in April. Private T H Dorsett (Hampshire Regiment) is killed in action at age 20. His brother died in October 1915. 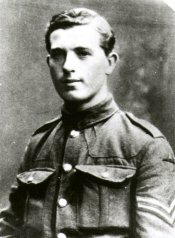 Private Charles James W Martin (Machine Gun Corps) is killed at age 22. His older brother was wounded in October 1914 and will die from the effects of those wounds in June 1920. Private Joseph Booth Hodgkin (North Staffordshire Regiment) is killed at age 21. His brother was killed in October 1916. Private Richard Lloyd (Monmouthshire Regt). Killed in action near Dadizeele 14.10.1918. RIP.